When watching every TV series, you’re bound to find your favorite characters. Sometimes, as the series progressed, one character replace another as your favorite. At least that’s what I experienced with the TV series Game Of Thrones. While in the beginning my favorite character was Ned Stark, due to his virtuous, honorable, and impressive attitude, after his shocking death I was drawn into another character, Tyrion Lannister. To me, Tyrion represents many mistreated people out there who do not get their fair chance. Intelligent, witty, well-read, resourceful, cunning and smart, Tyrion was treated as a second-class person due to his dwarfish stature. Anyway, I tried a new technique out of my laziness here. I cut the the tip of the brush a bit, and use it to make shades out of many points. I also used it to draw the hair and I could do it very quickly with it. Gotta admit, it saved me plenty of times, although I found out that I gotta be extra careful when shading the delicate parts such as lips and eyes. That’s my tribute to the mistreated giant trapped in a dwarf’s body. ~ by edwinlives4ever on December 2, 2014.
he’s mine too. he’s what makes the series worth watching. I share the sentiment. 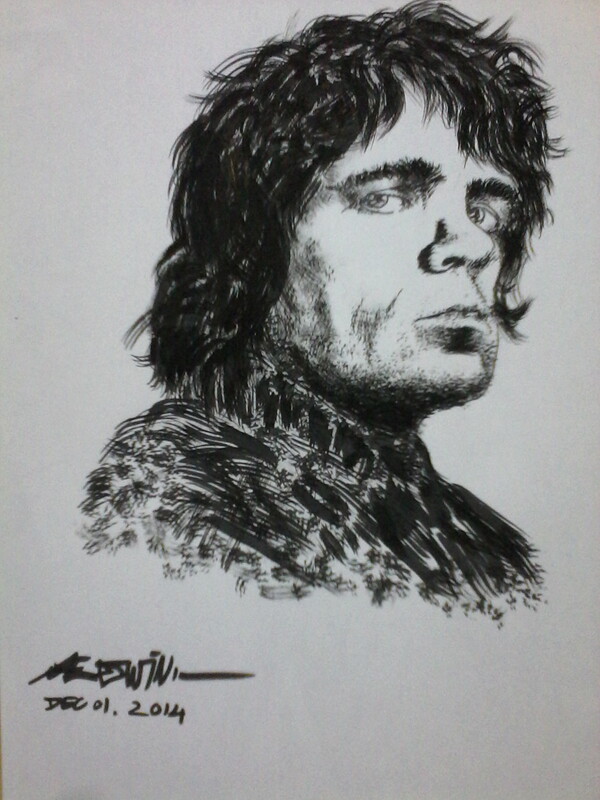 As in popularity, Tyrion’s the counterpart of Daryl in The Walking Dead TV series. Any of those two dies, and there’ll be riots in the streets. haha! YES! although i prefer the comic book to the tv series. have you read the comic books? i still watch it though. wasn’t prepared for beth. did you see that coming? Yup, same here and I’ve read all the way to issue 133. However, I kinda feel that the comic series is not as good as it was. I think they should’ve stopped right after the All Out War storyline, after Negan was defeated. You know, that “quit while you’re ahead like Seinfeld” philosophy? Beth’s death is inevitable. You see, I’m beginning to think that killing a main character each season has become a necessity in this series. Fans know this, and they watch it anyway for the pain. And I think you saw that coming. I mean, look at the circumstances preceding her death. Aren’t they reminding you of Sophia’s death? Yes, but I didn’t expect her to get knocked off then. But it does make it more tragic that she never saw her sister… I am finding the latest issue slow, I haven’t even finished it. It’s still sitting on my bedside table. Nah, I hope they don’t end it yet. Other zombie lit’s not quite as good. Or do you have a series/books you can recommend? Not at the moment. Now I’m back to reading Max Brook’s The Zombie Survival Guide for a change. That’s a really nice drawing. Is it ink? Yes, it’s known here as “Chinese ink” or “bak”. Thank you. As implied in the title, he’s my favorite character, too.